1) Global sea level rise was constant throughout the 20th century, with "small or no acceleration, despite the increasing anthropogenic forcing," in other words, increased CO2 has not accelerated sea-level rise. 2) The rate of glacier mass loss "was not smaller in the first than in the second half of the century," in other words, increased CO2 has not accelerated glacier mass loss. 3) Future projections of sea-level rise "depend on the existence of a relationship between global climate change and the rate of sea-level rise, but...such a relationship is weak or absent during the 20th century." In other words, alarmist projections of sea-level rise are based upon the false assumption of a human influence on sea-levels, which is not found by observations. In sum, global sea-level rise during the 20th century was constant, not accelerated, and shows no evidence of "climate change" or human influence. Sea levels rose more than 3 times faster from the last ice age 20,000 years ago until about 8,000 years ago than during the 20th century . 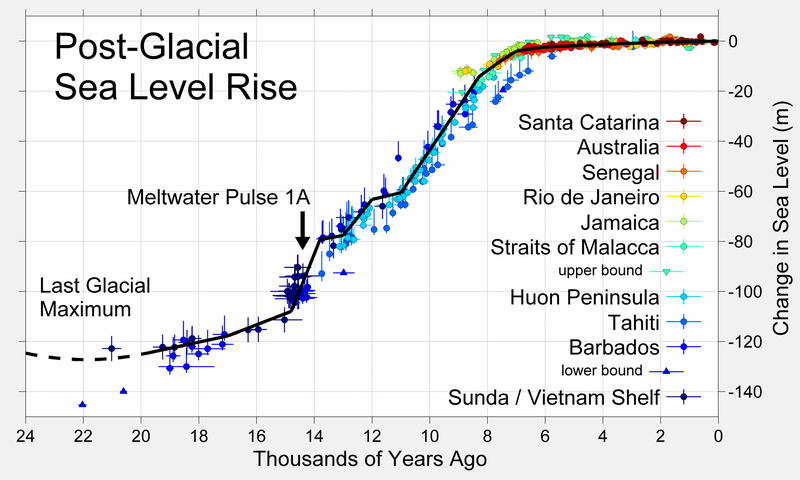 During Meltwater Pulse 1A shown above, sea levels rose about 15 times faster than during the 20th century. Sea level rise has been at a relatively constant, low level during the past 8,000 years. 1 NCAS-Climate, University of Reading, Reading, UK. 2 Met Office Hadley Centre, Exeter, UK. 3 CAWCR, CSIRO Marine and Atmospheric Research, Hobart, Australia. 4 Department of Physical Geography, Utrecht University, Utrecht, The Netherlands. 5 Deltares, Delft, The Netherlands. 6 Byrd Polar Research Center, and Department of Geography, Atmospheric Sciences Program, The Ohio State University, Columbus, Ohio, USA. 7 Institute for Marine and Atmospheric research Utrecht, Utrecht University, Utrecht, The Netherlands. 8 Department of Geography, Trent University, Peterborough, Ontario, Canada. 9 Département de Géographie, Université de Liège, Liège, Belgium. 10 Department of Geography, University of Sheffield, Sheffield, UK. 11 Earth System Sciences and Departement Geografie, Vrije Universiteit Brussel, Brussels, Belgium. 12 U. S. Geological Survey, Reston, Virginia, USA. 13 Centre of Climate and Cryosphere, Institute of Meteorology and Geophysics, University of Innsbruck, Innsbruck, Austria. 14 National Oceanography Centre, Liverpool, UK. 15 Department of Geography, University of Calgary, Calgary, Canada. Confidence in projections of global-mean sea-level rise (GMSLR) depends on an ability to account for GMSLR during the 20th century. There are contributions from ocean thermal expansion, mass loss from glaciers and ice sheets, groundwater extraction and reservoir impoundment. We have made progress towards solving the “enigma” of 20th-century GMSLR—that is, the observed GMSLR has been found to exceed the sum of estimated contributions, especially for the earlier decades. We propose that: thermal expansion simulated by climate models may previously have been underestimated owing to their not including volcanic forcing in their control state; the rate of glacier mass loss was larger than previously estimated, and was not smaller in the first than in the second half of the century; the Greenland ice-sheet could have made a positive contribution throughout the century; groundwater depletion and reservoir impoundment, which are of opposite sign, may have been approximately equal in magnitude. We show that it is possible to reconstruct the timeseries of GMSLR from the quantified contributions, apart from a constant residual term which is small enough to be explained as a long-term contribution from the Antarctic ice-sheet. The reconstructions account for the approximate constancy of the rate of GMSLR during the 20th century, which shows small or no acceleration, despite the increasing anthropogenic forcing. Semi-empirical methods for projecting GMSLR depend on the existence of a relationship between global climate change and the rate of GMSLR, but the implication of our closure of the budget is that such a relationship is weak or absent during the 20th century.